We often assume that revolutionary technological advancements are the stuff of MIT scientists or Silicon Valley entrepreneurs, but that’s not always the case. All it takes to change the world is a good idea and the courage to see it through to fruition. 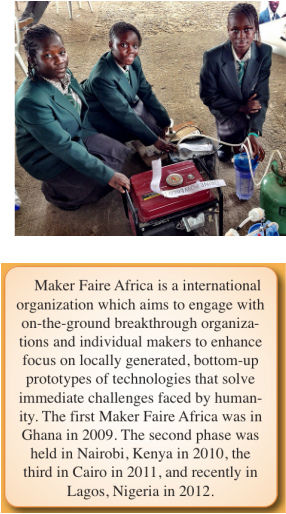 That process is paying off for a group of four African teenagers who’s recent Maker Faire Africa submission is rocking headlines around the world. The girls are Duro-Aina Adebola (14), Akindele Abiola (14), Faleke Oluwatoyin (14) and Bello Eniola (15), and they all participated in the Maker Faire Africa last November in Lagos, Nigeria. Reliable electrical power is hard to find in many parts of Africa, and the girls wanted to make something that would be truly useful. Together, they assembled a working generator that’s capable of turning a single liter of urine into 6 hours of electricity.